It is very possible that I may write about making winter hats from old sweaters and taking a walk to find spring flowers in the same week. I know this seems a little silly but that's the kind of winter we have had. Despite the fact that we have had very few really cold days (and I am not complaining) we have had plenty of oppurtunities to wear our sweater hats. Inspired by the book "Handmade Home" By Amanda Blake Soule, I made these hats a few months ago from an old sweater we had. I love working with felted sweaters, they are very easy to use, easy to cut, easy to sew and easy to add needle felted decorations. For the full directions and pattern check out Natural Home and Garden or the book. I honestly did not use the patterns from the book, I just sort of eyeballed it, using one of the girls hats to help figure out roughly how big the hat should be. I saw these cute owl hats on Pinterest and this great tutorial for how to make pom poms (which have since been one of my favorite things to make.) The hats were very easy to make, and there are so many different things you can do with them. I think they will become a new yearly tradition just like our Sweater Mittens! 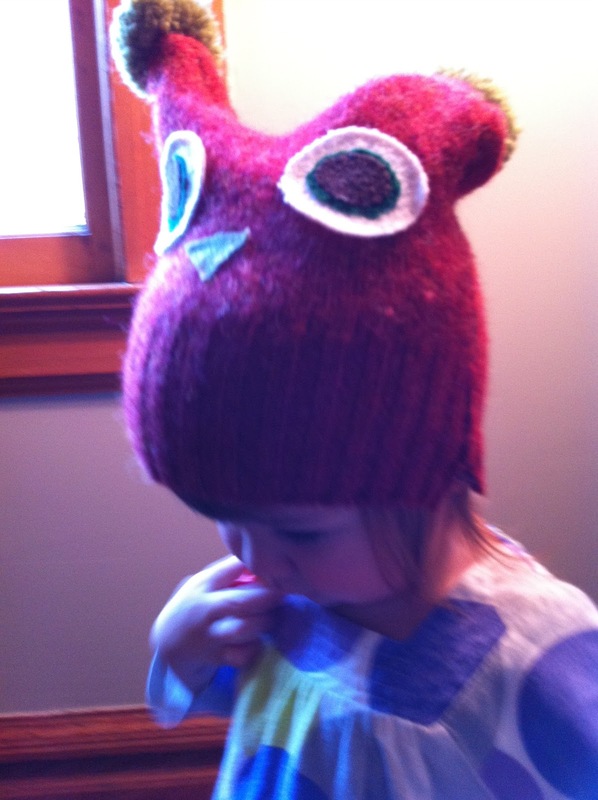 oh my goodness thats the cutest hat evaaaaar!